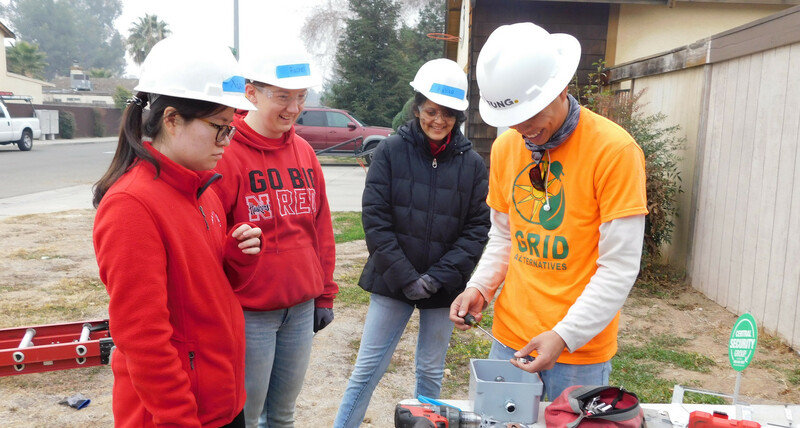 “It’s very important that we are contributing to something that can have an impact on the future,” says David Fung, Team Leader at GRID Alternatives Central Valley. David was working as a bartender when he first learned about GRID. On his first day as a GRID volunteer a year ago, he helped local veteran Hugo Rabson with the installation of his solar electric system. That day David realized that GRID was a part of something bigger, an organization with a mission to help. Since then he has volunteered for over 1,000 hours and counting, showing up every single day for GRID and the people it serves. David doesn’t just volunteer on installs; he has also helped out with career fairs, orientations and in-house trainings. David says he was “a quiet kid,” but these days he’s a great advocate for GRID Alternatives Central Valley. On any day at a jobsite, you can find him teaching high school students, Proteus job trainees, and other volunteers how to lay rails, run conduit, or use a sawzall. . David is always there when you need him, always ready to teach and support. David offers this challenge for anyone wanting to volunteer: not to reach or beat his 1,000-hour milestone, but just to come out and experience the "GRID Central Valley" way, or participate at a GRID office near you.